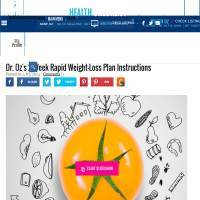 Dr. Oz’s Rapid Weight Loss Plan is a 2 week schedule of healthy eating and exercise which aims to help you shed the pounds. It’s part of a much larger website which provides health information, links to articles, recipes and more, under the umbrella of Dr Oz. If you’ve never heard of Dr Oz before (we hadn’t) then you’re in for some interesting viewing. There are videos around the site, some of which allow a sneak peak at his show. Some of these verge on the fantastical, with pseudo-scientific entertainment sections, such as “I had a traumatic brain injury and now I have an amazing talent.” The fact that Dr. Oz endorses stories which seem to have very little scientific basis, will be a little worrying for many people. However, the diet plans do seem on the money. They’re free to try out and provide a step by step method for each day, plus tips on how to make the most of your 2 weeks. You can find smoothies, healthy meals, snacks and general advice on how much to exercise, and more. These aren’t tailored to you, so they’re quite general (and not flexible) but the basic premise seems sound. Members can leave comments on blog posts, TV trailers and slideshows, among other things. You can also follow the show on Twitter and Facebook. Unfortunately, DoctorOz.com does feel like it’s more about the TV show and getting ratings, than in being a really useful medical resource. That said, some of the articles are useful, there just aren’t enough of them. That’s a fault with the site more generally: it sets itself up as offering support and practical advice, but there’s not nearly enough of it. Perhaps it’s there more as a taster, to encourage you to pay for the magazine subscription, which is pretty affordable. Still, we can’t quite shake the feeling that DoctorOz isn’t really offering everything it could. There are not really any nutritional tools or exercise videos, no way of planning or adapting your own eating diaries or workout schedules. And as for some of the television content... well, they say laughter is the best medicine. If you’re looking for a 2 week weight loss plan and don’t mind sticking to a very rigid set of advice for that period, this site probably is worth visiting. There are also a few decent posts to read with regards to what to eat to prevent common health problems. However, if you’re looking for the full package, and a system which will offer a lot of support over time, Dr. Oz’s Rapid Weight Loss Plan probably isn’t it.